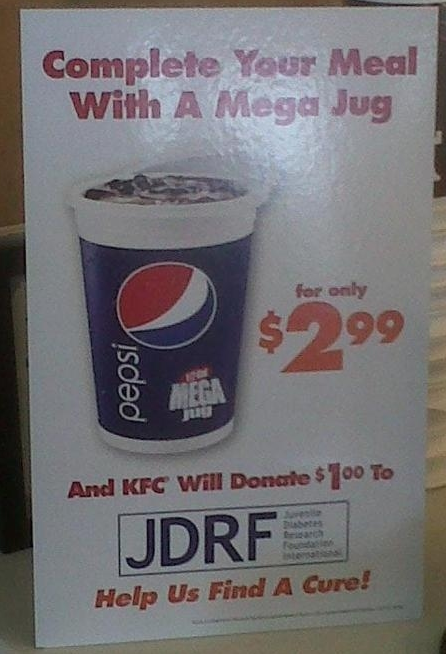 A KFC franchise in Utah is asking customers to help fight diabetes — by purchasing an 800-calorie Mega Jug of sugary soda to wash down their meals. For every $2.99 half-gallon drink it sells, the chicken restaurant promises to give $1 to the Juvenile Diabetes Research Foundation (JDRF). The promotion has drawn criticism from anti-obesity activists, who still haven't forgiven KFC for last year's unveiling of the Double Down sandwich, which ensconces bacon and cheese between two fried chicken breasts. But Gary Feit, a JDRF spokesman, is defending KFC, pointing out that the Type 1 diabetes his organization researches is not caused by diet or obesity. Besides, he adds, only one franchise is involved.